An Albanian boy peers over a concrete wall. Squinting, he looks up at a Serbian police officer standing watch at a building 300 feet away. Pointing at the building, the boy speaks to someone behind the nearby mosque, and within minutes a man in camouflage emerges. Positioning the boy in front of him, the man looks through binoculars at a half-constructed building now serving as a Serbian police checkpoint. Moments later, five children nervously stroll out from behind the mosque. A half-dozen men, all carrying automatic rifles, use the children as human shields to sprint to a bunker just behind the mosque. After taking a position behind stacked sandbags, a sniper points his rifle at the police officer. The children scatter. "This is how it goes everyday," says Serbian police officer Trifko Trifkovic. "Sometimes they use the kids, other times they just run to the bunker." This is southern Serbia, a place where the Kosovo war continues outside the lens of the world's media. 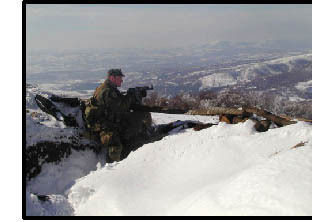 Shortly after the NATO bombing ended and an international force assumed administration of the southern Yugoslavian province, armed Albanians calling themselves the Liberation Army of Presevo, Medvedja and Bujanovac (UCPMB) began carrying out attacks on Yugoslavian and Serbian security forces outside Kosovo. The Presevo Valley, as Albanians refer to the region, is majority Albanian. The UCPMB say they are fighting to liberate the area from Belgrade's repression and unite it with Kosovo. A Serbian police officer watches over Bujanovac. Kosovo in this region," says Shaip Kamberi, president of the Albanian Human Rights Council in Bujanovac. "This made the situation even worse because these forces have significant anti-Albanian sentiments. They were harassing Albanian citizens physically and psychologically." Kamberi says that when the UCPMB first emerged, local Albanians were confused. "But after they occupied parts of the area, people began looking at them with sympathy. We now have a number of young people from local villages who have joined the UCPMB." Over the past 14 months, the UCPMB has regularly shelled Serbian villages, launched grenades into police and army posts, and opened fire on Yugoslavian security forces with sniper rifles and heavy machine-guns. They have killed 11 police officers, one soldier and eight civilians, according to official government sources. The attacks, numbering well into the hundreds, have destroyed scores of homes and wounded dozens of civilians. The UCPMB, an offshoot of the Kosovo Liberation Army, is operating out of the 58-mile-long, 3-mile-wide demilitarized zone separating Kosovo from Serbia. Under the agreement, signed between NATO and Belgrade at the end of the war, only lightly armed Serbian police are allowed to patrol the zone. But the uniformed, armed Albanian forces, supposedly banned from entering the area, now run it almost entirely. It is from the eastern part of Kosovo, patrolled primarily by U.S. forces, that the UCPMB are penetrating the zone, carving pockets deeper into Serbia proper. As Yugoslavia's Secretary of Defense Milovan Coguric says: "It's a zone of insecurity." In November, Serbian security forces and the UCPMB agreed to a de facto cease-fire after three Serbian police officers were killed in the village of Dobrosin. But in early February, as the newly elected government in Belgrade began winning increased international backing for its plan for the area, which includes greater integration of Albanians into government institutions and local police forces, as well as hundreds of thousands of dollars in economic aid, the UCPMB launched some of the most intense attacks in months, shelling the Serbian villages of Lucane and Veliki Trnovac. These attacks came just hours before the arrival of the top two U.S. diplomats for Yugoslavia, Ambassador William Montgomery and special envoy James Pardew. As the armored convoy carrying the two diplomats traveled to a Serbian police checkpoint in Lucane, UCPMB forces fired two sniper rounds from the neighboring mountains. The convoy sped away. Yugoslavian President Vojislav Kostunica's government has ordered its forces, clearly better-armed, better-trained and greater in number than the UCPMB, not to take action. Serbian forces are to respond to attacks only if they face an imminent threat. "Our forces don't need more than one day to resolve this situation militarily," says Rasim Ljajic, Yugoslavia's federal minister for ethnic and national communities, who recently served as a special envoy to the region. "But what comes after this? We would endanger the lives of the remaining Serbs in Kosovo. They would become like clay pigeons for the Albanians." Yugoslavian and Serbian officials say the aim of the UCPMB is to provoke its security forces into a radical response to demonstrate that the new government is no different than the regime of Slobodan Milosevic. But Belgrade is giving the international community, mainly the forces of KFOR in Kosovo, time to make good on its pledges to defuse the situation. "We believe that we can solve this problem in a peaceful manner, together with the international community," says Coguric. "But it's never too late for a war." On the frontlines among Serbia's Special Police Force, patience with diplomacy is wearing thin. "We are certainly in a state of emergency because terrorists are actually carrying out attacks in Serbia proper," says Col. Goran Radosavljevic from a muddy trench during a UCPMB attack. Radosavljevic, the newly appointed head of Serbia's most elite force, became a national hero during the revolt against Milosevic: He was one of three senior commanders who refused orders to have his troops fire on demonstrators. "Actually declaring an official state of emergency is not our jurisdiction," Radosavljevic adds. "That's something the government does." Another top Serbian police official says they are expecting even heavier attacks by the UCPMB over the next few weeks. If the international community fails to take action as promised, Belgrade will have a difficult time convincing not just the security forces, but the Serbian people as well, that a diplomatic solution exists. Jeremy Scahill was one of the few foreign journalists in Belgrade during the overthrow of Slobodan Milosevic. He frequently reports for Pacifica's Democracy Now!